Every month, Karen Moses’ fourth grade class celebrates kindness with First Friday Friendship Fiesta. Last month, the students took their fiesta on the road to the Highgate Senior Living Center, where they visited with residents. The Friendship Fiesta is typically a classroom event. “We do a big potluck in the classroom, watch some quick inspirational videos, and I read from the friendship box,” Moses explained. During the first month of Friendship Fiesta, they talked about how they could impact their class. The next month, it was how to impact their school. And last month, they talked about how to impact the community. “Visiting the senior center was one way to impact our community,” Moses said. A few weeks before the visit, the students wrote letters and sent photos to residents of the Highgate Senior Living Center. Then during art class, they made decorative yarn Christmas trees and gift-wrapped them. The students also wrote handmade cards. On the day they visited the senior center, the students were each paired with a senior citizen. “The kids just sat and visited with them for about half an hour,” Moses said. “It was amazing! The kids did such a nice job conversing with them.” After a half hour of conversation, the students presented the gifts and performed a song they had learned for a school concert. The Highgate residents were delighted with the students’ visit. And the First Friday Friendship Fiesta made its circle of friends a little wider, reaching out to the community to connect with new friends. 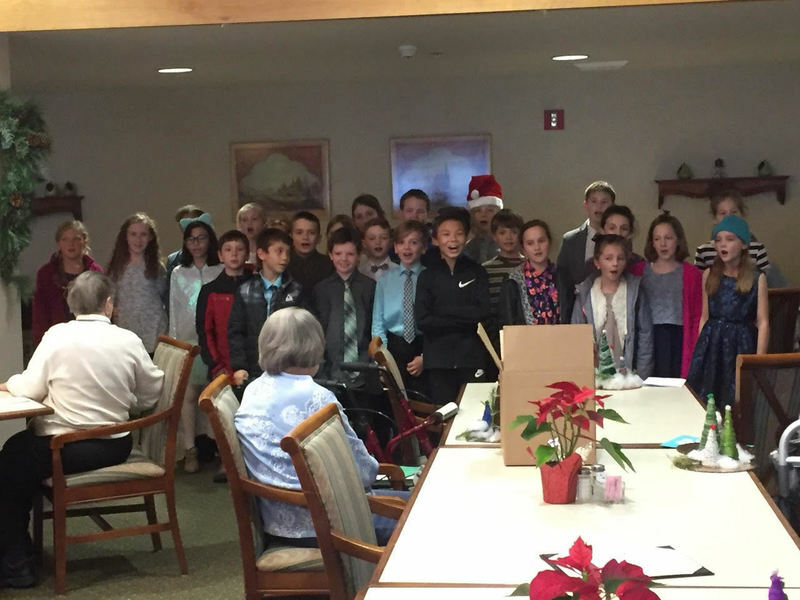 South Ridge Elementary fourth graders sing for residents at Highgate Senior Living Center.